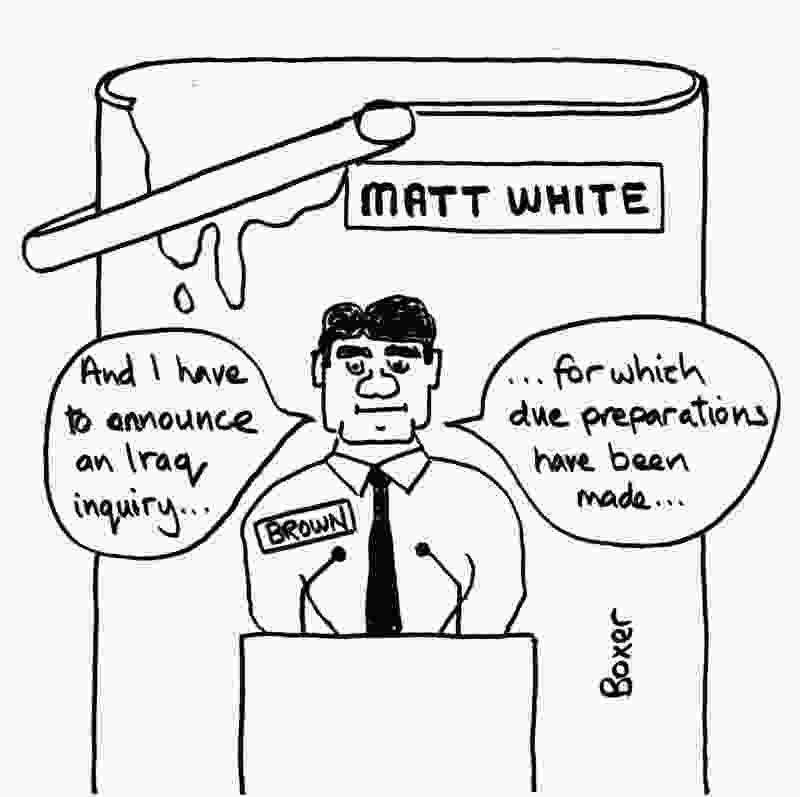 www.newworker.org | 19th June 2009 - Secret Iraq war inquiry: WHO IS BROWN PROTECTING? Secret Iraq war inquiry: WHO IS BROWN PROTECTING? GORDON Brown has just heaped another load of trouble on his own head and given his enemies another stick to beat him with by declaring on Monday that the long-awaited full inquiry into the reasons behind the Iraq War will be held in private. He must have known how ridiculous this decision would appear after his recent promises of more openness and transparency in government. And he must have known the flak he would get from all sides, from the families of dead servicemen, peace campaigners, and military generals – and all at a time when his premiership is getting ever shakier and more vulnerable. So we can only conclude that what would come out if the inquiry were held in public would be even more damning. Several Labour backbenchers have called for the inquiry to be made public; Gordon Prentice said he was “not prepared to accept a secret inquiry into Iraq”. Alan Simpson MP, who chairs Labour Against the War, said before the decision to go private with the inquiry was announced, that Brown’s strategy of using the inquiry as part of a personal fight-back was in danger of backfiring spectacularly. “If it is done secretively, it could be the final nail in his coffin. Rose Gentle, whose teenage son Gordon died in Iraq in 2004, said that families who had lost sons and daughters in the Iraq War would protest in Whitehall if the inquiry was “closed”. Then Cabinet Minister Ed Balls gave Downing Street a bad turn when he said in a television interview that the inquiry could be “more open” and that his “personal view” was that the Iraq inquiry should be accessible to the public. Later he backtracked a little, saying that what he meant was that people should be free to give evidence to the inquiry. He also said he was confident Brown “looked into this in great detail” before making a decision, but that it was important for generals, officers and ministers to feel they could give “very open” evidence. The inquiry will start in July and take at least a year to complete. It will cover the period from July 2001 to July 2009 and be chaired by civil servant Sir John Chilcot. Brown said that it will not seek to “apportion blame”, but will aim to identify “lessons learned”. He claimed that privacy was essential to ensure that the evidence given by politicians, military officers and officials would be as “full and candid as possible”. But the military top brass insist that the only people with something to hide are the politicians. General Jackson, head of the Army during the invasion, said he would have no problem in giving evidence in public. He said Brown’s decision to hold the proceedings in private fed “the climate of suspicion and scepticism about government” and that he ought to consider requiring witnesses to give evidence on oath. “I do not see why it could not have gone for a halfway house with sessions in public and then having private hearings when it comes to intelligence,” he told the press. In February, Justice Secretary Jack Straw vetoed the publication of minutes of Cabinet meetings discussing the legality of the war in the run-up to the illegal invasion.